Dark Navy Blue unfinished Leather Shoulder Strap. A replacement strap suitable for a handbag. Available in; dark navy. 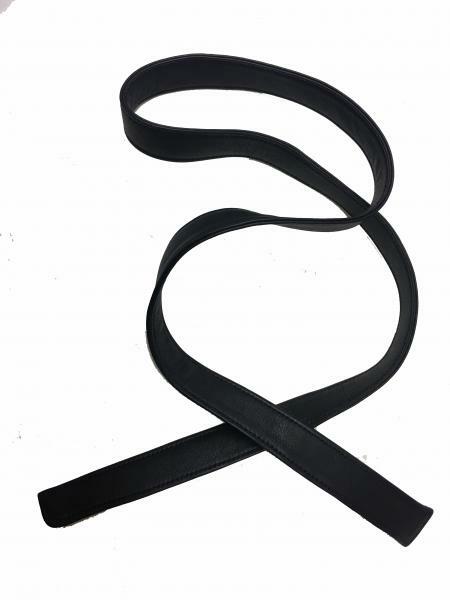 This strap is approximately 102cm long and 23mm wide. It can be attached directly to your bag with rivets or have trigger hooks which in turn clip onto your bag. It is made of top quality leather. If your strap needs fixing by us and you would like a quote please email me (Paul) pj@saddler.co.uk and I will be happy to advise you. This Tubular Rivet is very easy to use, the two parts snap together and to bond them into position you simply tap them together with a hammer. NB They are Chrome finish NOT brass as shown and are useful for attaching handbag straps, securing belts and straps and also for other decorative leather work. The male part is 8mm long and the head size is 10mm. They are supplied in multiples of 10.